1.Mix all ingredients in a bowl thoroughly. 2.Heat the oil in a frying pan and fry like you would any other pancake on both sides. 3.Remove from pan to drain and serve with sour cream. Since all of my neighbors grow zucchini in the summer and there’s always an abundance, I’m regularly on the lookout for new zucchini recipes. This one’s a keeper! 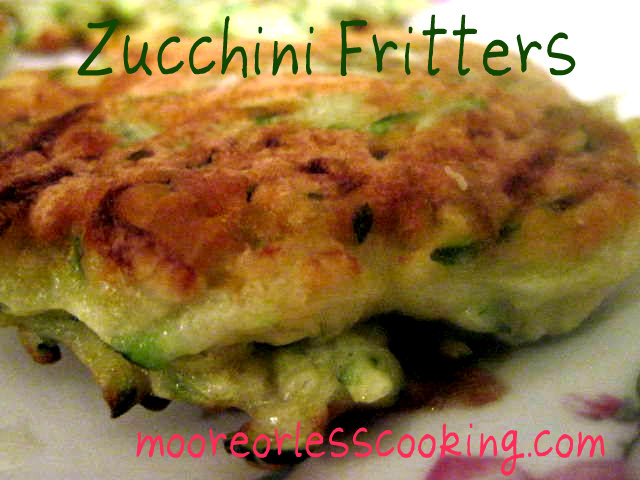 WOW WHAT A WONDERFUL USE FOR THE TONES OF ZUCCHINI OUT OF YOUR GARDEN THIS SUMMER. I think I already have you on one of my blogs. I’ve been making these for years but add 1/2 small sweet onion, 4 cloves garlic and 1 cup grated Parmesan cheese along with a dash of salt and pepper. I finely chop the garlic and onion in the food processor before adding to the batter. So good!!! !